We all know that education budgets are getting cut more and more, and that meaningful professional-development opportunities have unfortunately become a bit of an oxymoron in education. Not only can being a "connected educator" help change that, but it can also provide you with ongoing inspiration and support. I'd even go as far to argue that being connected will be the most impactful thing you can do in your career. So with all of that said, I'd like to provide you with these ten tips on how you can get connected -- starting tomorrow. I've been in so many meetings with educators who talk about the power of making mistakes. We all nod our head in agreement and say that not only is this important for us to teach, but we also need to walk the walk. But when it really comes to us, we hesitate. Why? Because we're afraid. Just with learning anything new, mistakes will be made. It's how you learn from them that matters. Still need convincing? Here are Seven Wonderful Ted Talks on Learning from Failure. When I teach others how to get started using social media for professional development, many request a manual of some sort -- a detailed step-by-step account that tells you exactly what you need to do. There are some guides out there that can help (here's a collection of resources on Twitter I like), but you can't learn how to connect to other educators from a manual. I'd recommend surveying your social landscape and deciding on one social space you'd like to try first. The most important thing to keep in mind is that just because someone is using this social network a certain way, that doesn't mean it's the right way for you. Think of some goals that you'd like to achieve and start from there. Once you get more familiar with the platform, you'll be able to refine your goals. I recently heard this playful metaphor of a puppy getting loose for the first time to describe how people should use social media. When loose, the puppy jumps a fence and doesn't look back. No hesitation -- it's running full speed to explore -- and most likely get into trouble. That type of excitement and non-hesitation is needed (minus the trouble) if you're going to dive into social media and really experience it. Make those mistakes, listen, and reflect on how you can use all this to help you. One of the things I love about being connected is that I'm constantly learning important things that weren't originally on the top of my list to learn. It's kind of like that old saying, "You don't know what you don't know." 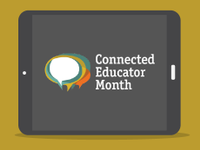 By being connected, you can be directly connected to some of the greatest and most inspiring minds in education (check out the next tip on how to do this). Just make sure that you're in a mental space to learn things that may not currently be top-of-mind for you. If you're in an online community, look at discussions that you've learned from -- who's commenting? Make sure to friend or follow them. If you're on Twitter, you can start by following these lists of inspiring people in Education: Edutopia bloggers, Edcamp Organizers and Great Educational Organizations. On Twitter, you can also search for specific topics; here’s a list of education-related hashtags and education chats. Within your searches, feel free to follow people that you're interested in hearing more from. And if you're on Google+, you can peruse the many education-oriented communities to get your network started. There are so many free online events out there to take advantage of. Whether it be a live Twitter chat (here's a list of them all), a Google Hangout On Air or a virtual conference, they are all great on-demand ways to learn. Side note: Every week, Edutopia highlights upcoming edcamps, webinars, and virtual conferences on this page. If you don't prioritize this, it won't happen. At the minimum, I'd suggest reserving 30 minutes of your work week -- that's only six minutes a day. And once you get more familiar with everything, you'll actually find that being connected will save you time (no joke!). Many join a social network and think that they need to be "Jane Doe, 7th grade science teacher." I know you're more than just that. Add some personal things about yourself so that people can connect with you. For example, if you have a passion for running, add that, and mention it occasionally. I tend to use the metaphor of a cocktail party to help guide proper interactions in online spaces. The people you like to talk to at a party are people that listen, don't talk about themselves all of the time, and perhaps offer helpful advice. At the heart of social media is the word "social" -- if you wouldn't do something in person, it's probably not right for social networks either. Once you get a hang of being connected, make sure to share your experience and thoughts with others through blogging. Blogging is a great way to reflect on what you've learned in your personal learning network (PLN), and it's also a fabulous way to give back. Please feel free to use the comments section below for asking any questions you have on how to get started. I'll make sure to respond to all comments. Hope to see you on a social network soon!